Without a doubt that Kaspersky is known as one of the best antiviruses. If you check AV-Comparatives.org, you’ll see that its performance tops the chart most of the time. This is mainly due to its large signature database, frequent virus definition updates, smart heuristic analyzer and strong static unpackers that allow it to unpack more packers/ciphers than most antiviruses. Kaspersky has an online scanner but it can only detect virus but not removing them. If you want to remove, you must purchase their product. Two months ago I discovered a method to obtain free Kaspersky Anti-Virus license that works for a year and I am sure many of you manage to get the free license. If you visit my site daily or subscribed to my daily newsletter, you wouldn’t have missed this great offer. If you wasn’t able to get the free license, not to worry because Kaspersky themselves are offering a FREE tool that is similar to Kaspersky Anti-Virus but without real-time scanning. 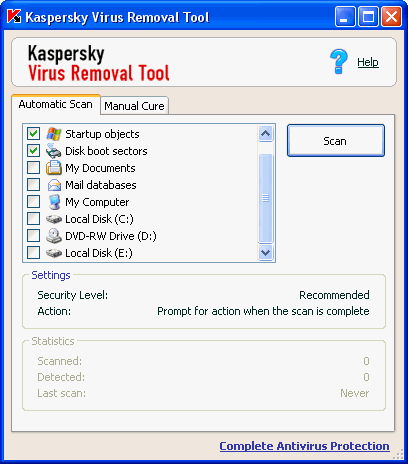 Kaspersky Virus Removal Tool is a free on demand virus scanner and cleaner. It uses the same technology as Kaspersky Anti-Virus to detect and remove viruses. For a free tool, it is very configurable, allowing you to set what to scan, how much to scan, whether to use heuristics etc.. There is another feature called “Manual Cure”. It works similarly as HijackThis. You press the Collect system information button to gather information about your computer. Then Send the report to VirusInfo analytics forum. The people from the Kaspersky forum will then let you know the script to paste on the program and then click the Execute button to fix the virus. Other than not having real time on access scanner, Kaspersky Virus Removal Tool also doesn’t have an updater function. So you will need to download the whole 16MB package every time you want to use the latest version to scan and remove virus. If you are already using other anti-virus program such as Bitdefender or NOD32, you can still install this and run periodically, maybe once a month for a second opinion. This is not an real time scanner, so it won’t affect your currently installed anti-virus program. Kaspersky Virus Removal Tool may looks like portable because when you run the setup, it actually extracts the contents to “Kaspersky Lab Tool” folder at your desktop. However, it is NOT portable because it installs a service that is set to autostart. If you try to delete the folder, you’ll get the error message “Error Deleting File or Folder“. The reason you’re unable to delete the folder is because Kaspersky Virus Removal Tool has a feature called “Self-Defense”. It is used to protect itself from being infected by viruses. If you want to delete it, you must click Settings at the program and uncheck “Enable Self-Defense” checkbox. The best thing is that it is portable, it is possible to go in a pendrive. this is one great tool. thanks.